Do you let your AMG warm up on chilly morning? I know for a fact that Mercedes-AMG fully tasted the M113K and M156, in extreme weather conditions before these engines ever went into full production. Now that January has arrived, and temperatures are starting to fall. 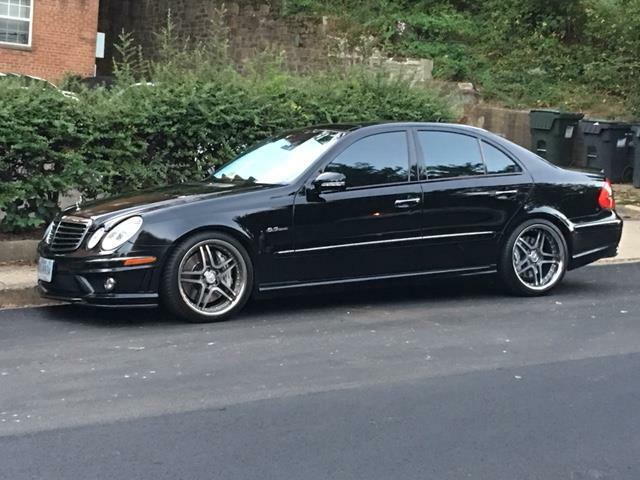 I'm just curious to know, how many of you actually let your E55 or E63, warm up in the morning before driving off. I personally let my car run about 15-20 minutes, when the temperature is below 32 degrees. Besides I like getting into a warm car, with warm seats. Good to know thank you. I dont drive the E much in the winter and keep the summer tires on, wont drive it when temps are below 40 degrees. When I do drive, i let the oil temp get to mid 40s/50, and go light until oil temps show 90s considering it take trans fluid a little more time to get to temp and gives more time to warm the tires. 1. Never operate your engine at full throttle when the engine is cold. When starting the engine each day, allow plenty of time for the oil to reach full operating temperature before running above 2,500 RPM. Full supercharger operating temperature is generally achieved after the engine water temperature has been at the normal operating range for two or three minutes. Last edited by Pmarino; 01-03-2019 at 02:29 PM. I just get in and drive. Like everyone else I don't floor it until it has warmed up. Usually it only takes about 5 mins maximum for the coolant to reach steady temperatures. It should only take 2-3 seconds to get oil everywhere in the engine after starting it from completely cold. It takes many hours for that oil to drain fully back down into the crankcase and a thin film remains on all the bearings regardless. Once you have warmed up the engine there is no damage from start/stop engine features (on newer cars) or stopping for gas or an errand. I wait for the high idle to drop before leaving and take it easy on the car until it's fully warmed up. It's rare that it gets much colder than the low 30s here and the car is garaged. Don't have an E55 yet, but on all my cars I generally drive gently until operating temps are up. I don't like the idea of warming engine oil while the trans fluid is still cold. If its below zero, then I'll let the engine warm up on my vehicles a little before driving. This is exactly what I do also. Def once it reaches operating temp 3-5 minutes 80c or whatever. Why would MB use a supercharger that is damaged by cold start under 25 degrees? The cars are manufactured in a place that often sees temperatures under that. Not sure how accurate that is. I think if you idle the engine until the oil gets to 80degrees Celsius that may cause damages in long run like it says in the MSN article above. But if you start the engine and drive away immediately you are also gonna put additional stress on cylinders, as according to the article, gasoline washes oil off of the cylinders. I personally wait until the oil gets to 30 degrees Celsius and then drive slowly and try not to rev the engine above 3K RPM until it reaches 80 degrees Celsius and the oil mark stops blinking on the dashboard. I watched an engineer on Youtube who said that in fact keeping RPMs below 2500 is harmful, and that we had to use paddles to lock in the right gear manually, as the automatic will rush to the 7th gear. The reason he was giving was that the oil doesn't have enough pressure at lower RPMs and doesn't lubricate upper engine components properly. Now, folks in the comments to the video said that it applied to older cars as newer cars had electric oil pumps that ensure correct pressure regardless of RPMs. Does anyone know whether W211s have electric oil pumps? Why did MB say that the transmission fluid was good for a lifetime and it did not need to be changed ever, but now suggests to change it every 30k? Why is there no maintenance schedule to change the super charger oil in your owners manual? Why does MB install block heaters in some models? There are many "why would MB" questions I could ask, but I'll stop there. Like religion and law the written word is always open to individual interpretation. Remember; if you run the clutched super charger (that MB designed for the car) it does not engage on start up, maybe that kind of answers your question As for me, I believe SC manufacturer doctrine. I let it run for 15-20 minutes in the morning. I don't park in a garage so I gotta have the windows defrosted and snow melted. First up.... We are all using a high quality fully synthetic engine oil and change it on time? You should be. Modern synthetic lubricants are amazing animals. They flow readily at low temperatures, stick to lubricated parts after the engine has been shut down, keep the engine clean inside ect... All so much better then the Pennzoil my parents insisted on in every one of their engines when I was a kid that made for 1/2" of ick on every surface inside the engine over time and made for multiple failures as well. You mention gasoline washing down the cylinder walls during cold running.... This is much less an issue in fuel injected cars using modern synthetic lubricants then was the case in the bad old days of carburators, garbage lubricants that didn't get changed ect. At low ambient temperatures the oil will be thicker so more effort for the pump to deliver it. This is why we use a lubricant that does not turn gelatinous at low temps. Have you ever tried pouring 50 weight oil at ten degrees? A 5/20 weight oil pours and pumps easily by comparison. Oil at low temperatures is not going to lubricate as well as when hot + cold oil will collect water until brought up to high enough temperature to boil it off. Yes; water always finds it's way into the oil as perfect combustion makes CO2+H2O. Some combustion gasses always find their way past the rings. Short trips with oil never getting to 100C ensures that water never boils out. Not good. I have a neighbor whose work van gets started cold (ambient is 20-50f) driven five minutes and turned off. Every day. I got a call when he pulled a stick out of it and the stick had only.... *gasp! Milkshake on it! But not burning coolant. He now uses synthetic oils and changes it often enough. I start mine up in the garage... Give it ten seconds and drive gently until coolant and oil temps are over 80C unless emergency then it gets short shifted at 3000 and I make a mental note to change oil sooner. No electric oil pump in your E-55. Be thankful. Look to how it went for BMW with electric water pumps. Hmmmm.... I'm good with a chain driven mechanical pump. Beware 'engineers on YouTube.' Not everything you see on the Internet is true. It gets into freezing temps all winter where I live. Two winters in a row now I have shredded a SC belt after getting into some aggressive driving just after coolant temps reached normal op temps. I now am kind thinking the SC belt needs more time to heat up before putting it under load. Rubber gets brittle when it's cold. I'm going to start waiting until intake air temps reach their normal above ambient amount to ensure the temps in the engine bay have all steadied out and nothing is too much colder than normal. Gentlemen, I started this thread on the assumption, that when I mean chilly its actually cold, like 32 degrees or colder. Like this morning in Northern VA, it was cold out. And I typically let the car idle for 15 mins until the oil and engine coolant reaches it's operating temp. I personally don't think that anything is wrong with letting things warm up, before driving off to work. I know that AMG fully tested these engines in adverse weather conditions. But I'm old school, and I've done this for years with no ill effects. I just wondered how many others owners did the same thing. Last edited by Yuille36; 01-07-2019 at 02:41 PM. Gentlemen, I started this thread on the assuming , that when I mean chilly its actually cold, like 32 degrees or colder. I personally don't think that anything is wrong with letting things warm up, before driving off to work. I know that AMG fully test these engines in adverse weather conditions. good point for my drive tonight, should be 20f..i'm def letting everything get HOT first. I use the engine block heater so that i don't have to wait as long to idle up to operating temps. Note that the oil takes longer to heat up than the coolant during idle warmups. Having a warm engine before startup is good since internal metal components will be closer to operating tolerances... I would think tolerances are tighter for AMG engines. Quick Reply: Do you let your AMG warm up on chilly morning?